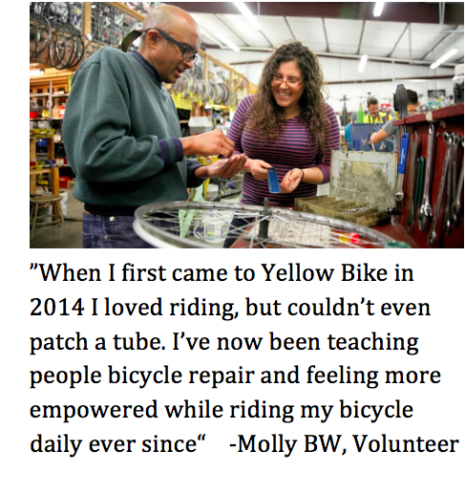 Thank you for your support of Austin’s Yellow Bike Project as we celebrate our 20th year serving Austin by getting more bikes on our streets. It is amazing to see what we have accomplished together and to look back over that time to see how our work has evolved. Started in 1997 with the idea to make and distribute free “yellow bikes,” the core work of the organization quickly became teaching people bicycle repair and refurbishing bikes for donation and sale, eventually abandoning the “yellow bike” endeavor entirely. Seven years ago we celebrated the completion of our amazing headquarters through the incredible support of the community (again, THANK YOU!). Together we constructed a $300,000 site made possible through $50k in donations and $100k through microloan community financing that was paid off in two years! Then, four years ago, after running 16 years 100% on volunteer power, we began to expand our work and programs through paid staff. Since we now have dedicated teachers, we have been able to welcome kids into the shop for after school programming. When Devin first came into our after-school kids shop this year, he was unfocused and easily frustrated. 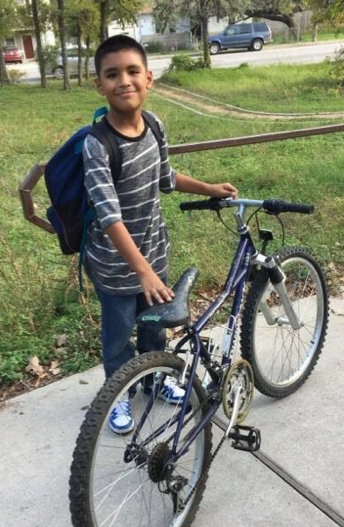 With guidance and encouragement from staff, he gained confidence over the 3 weeks he worked on his Earn-a-Bike. By the end, he knew that he could build a bike, and was excited for the work! Now he enjoys riding his finished bike with his cousin, and has even donated his old bike to Yellow Bike’s holiday bike drive so another kid could enjoy it! Your continued support helps us provide free transformational opportunities for people of all ages to learn the empowering skills of bicycle repair and use. Please donate today. We work hard to keep bikes out of the landfill and on the streets of Austin. Every year community members donate thousands of bicycles to Yellow Bike in hopes that they will be put to use (again, THANK YOU!). Since expanding our efforts through paid staff we have increased the number of refurbished bikes leaving our shop by 5 times, totaling more than 1,200 bikes leaving our shop this year. Half of these bicycles became reasonably-priced high-quality sale bikes restored by our highly skilled mechanic staff. The other half left the shop as donations (600 bikes!) to schools, community groups and efforts such as Hurricane Harvey relief, Refugee Services of Texas, and Caritas, as well as through programs like Earn-a-Bike. Your donation today helps us to continue to expand the ways we can get bicycles to people, particularly those in need. One of the incredible things about bicycles is that they can give people of all ages a low-cost and empowering way to get around. Our focus is being able to get bicycles to more people, particularly people who have limited mobility options. This year we were approached by the coach of a Congolese youth soccer team. He wanted to get his team some bikes so they could get to practice and school. Our staff was able to make this happen. As you can see, the kids are beaming with the promise of mobility and freedom. 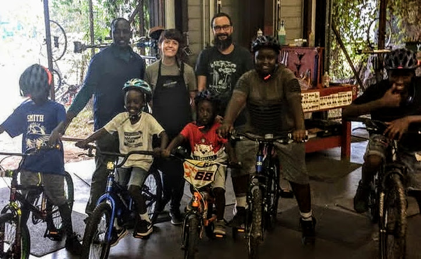 As bicycling in Austin is seen more and more as a normal, safe, healthy, inexpensive, and freeing way to get around, your support will help us get bicycles and bicycle skills to people who would not otherwise be able to partake of their many benefits. In closing, we are amazed at what we have been able to do this year and how far we have traveled together over the last 20 years. 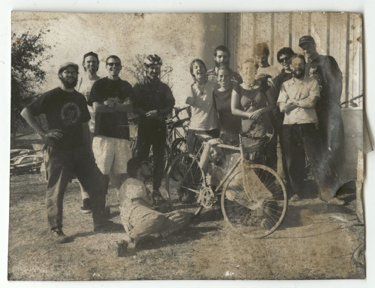 Many of our long-time volunteers remember the early days of riding in Austin, when it was likely you would recognize most people you passed who were also getting around by bike. Today the streets are teeming with people riding, a beautiful sea of mostly strangers. In 2009 we signed a 99 year lease with the City for our Headquarters site. We don’t know what the streets of Austin will look like in 90 years, but based on how far we have come we think that the future has the potential to be very bright [with blinky lights]. Donate today, and help us get more bicycles on the streets of Austin! Thank you for believing in the transformational power of the bicycle.